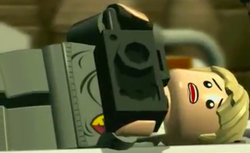 Colin Creevey is a minifigure which appears in LEGO Harry Potter: Years 1-4. In the Harry Potter storyline he is a talented photographer and is rarely seen without his camera. He sees the Basilisk, which would normally kill you, but because he saw it through camera he was only petrified. When the Mandrake draft was created, he, Filch's cat, Mrs. Norris, Justin Finch-Fletchley, Hermione Granger, Nearly Headless Nick, and Penelope Clearwater were unpetrified and returned to full health. He was killed at The Battle of Hogwarts in 1998. He looks almost identical to Ernie Macmillan, but the only differences are that Ernie is in Hufflepuff, while Colin is in Gryffindor.